Some readers do not like fiction, because novels and short stories are basically lies. In this era of "fake news" -- both real fake and merely accused fake, I guess we don't even have to go as far as reading a work of fiction to find fantastical situations and wishful thinking. Of course, I have my own enjoyment in reading books with the following scenario: protagonist has a lot of money, usually due to righteous reward for the correction of a horrible event, like wrongful conviction award, and even more contacts, friends and markers to call on, because he (usually a he, but I'd love to find a she among them) does good and keeps in touch with everyone or anyone whose life he has positively touched has found a way to find him when he needs them most. (I think the previous sentence is not very grammatical, sorry!, but hope it's understandable.) And, with this wealth of funds, friends and returned favors, he performs vigilante-style justice in some sneaky way, because the good government law enforcement cannot do so on its own, so that in the end, the bad guys are thwarted and the downtrodden and victimized are avenged. We root for the flawed heroes who might break or skirt the law, but they're only harming other bad guys and not innocent people. This is a fantasy, of course, but unless someone can prove me wrong, I will go on reading such fantasies and enjoying them. I felt sad reading the last Burke book by Andrew Vachss's Another Life not because Burke even fits this bill of rich guy operating outside the law, although he is rich in contacts and did operate outside the law. The book descriptions call him a "renegade" private operator. Vachss himself has quite a history of protecting the vulnerable. The last book has Burke riding off into the sunset, forgoing all of his contacts, cutting ties so that they will be safe. Sigh! The book now out of print that followed somewhat in these footsteps was John Clarkson's Among Thieves. Now, here's a guy who ended up in prison, convicted of hurting an off-duty police officer in a barfight, learning lots about criminals and putting himself out as a righteous dude. When he finally got sprung with damages paid, he set up a partnership with three other ex-cons which kind-of want to go straight, but mainly want to be with Beck, bought a building in a yet-to-be-totally-"up&coming" area, set up a bar for members only and began guiding ex-cons towards a better life, albeit a little shady. Of course, Beck (notice how close to "Burke" that sounds?) has to work outside the system to right the wrongs done by those who could skirt the law and he manages to make a few bucks while he's at it. And, now we have the latest entry, Stephen Mack Jones's August Snow. Snow was a cop who threatened or scared or angered the wrong other cop(s) and ended up on the wrong end of an Internal Affairs investigation. After getting that cleared up, he found that he didn't need a new building and all the people he wanted to protect still live right on the street of his childhood, along with a lot of abandoned homes. So, the block becomes a redevelopment project all of its own, providing jobs and consuming goods in the community he remains living in. So, of course, he has his support group -- at least those he knows about -- fairly close at hand. Snow probably has anger management problems, but he seems to put it to "good" use, again to hurt really only "bad" people. 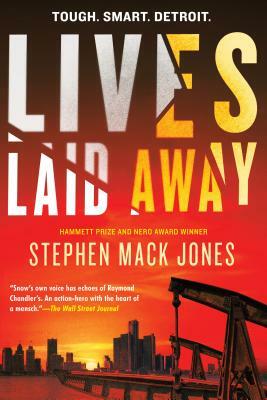 In Lives Laid Away, Snow shows his lack of concern for money even while he uses it for good, as he orders enough food for the block party and doesn't want to know the cost details of the houses he renovates and "flips." He sees that most people are three-dimensional and thus have good and bad sides. As such, he is willing to work with jerks in the Detroit Police Department and Immigration & Customs Enforcement (ICE), et al. At the end of this episode, even he is shaken by the depths to which a) paying forward really means and b) good people can be make hard choices really quickly. What's your favorite fantasy fiction?